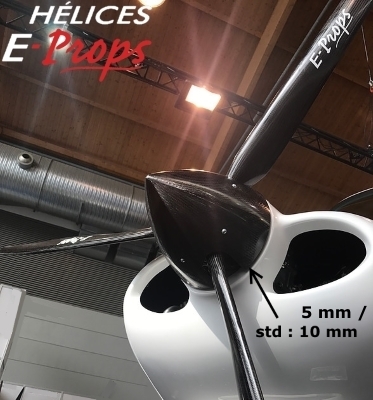 E-PROPS has developed an innovative system to replace the usual spacers in aluminium (heavy, expensive and difficult to assemble) : the EXTENDED HUBS. 3- Does your aircraft need an extended hub ? 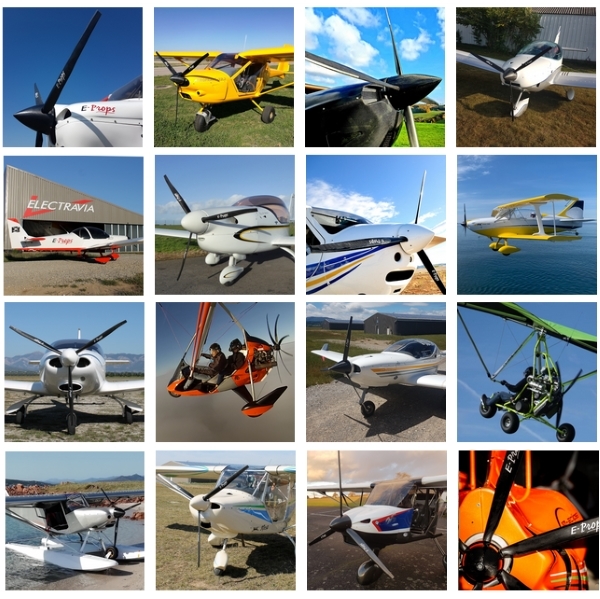 In leisure aviation, there are not large series as in the automotive industry. Aircraft manufacturers are used to change somes details on their aircraft, particularly engines covers. Sometimes the engines come outside the covers, and sometimes are inside. It depends on the versions... and it is impossible for propellers manufacturers to know all versions of all aircraft. Usually propellers manufacturers propose aluminium spacers if the engine is inside the engine covers, in order to space the propellers from the engine fairings. The E-PROPS solution is lighter, stronger, more secure and cheaper. For the moment, this system is available for the 3-blade tractor propellers for Rotax serie 9 engines. it means a reduction of 2 kg ! A too big weight hanged to the gear box is reducing its lifetime. The heavy propellers generate a significant risk of breakage of the gear box. Reducing the weight of the spacer allows to limit this risk. The extended hubs are at the same price as the standard hubs. No need to buy a spacer in addition. Considerable savings ! With an extended hub, the propeller centering is direct. No need of spacers and screws stacks, which can generate vibrations. A very simple system strongly reduces vibrations risks. The E-PROPS hubs, standard or extended, are extremely strong. Compact hub for minimum drag and to optimize engine's cooling. 3-blade propeller with aluminium spacer : 3 blades, 2 half hubs, 1 aluminium flange, 7 washers, 6 screws, 1 nut , 1 aluminium spacer, 6 drive lugs for spacer, 6 washers, 6 nuts, 6 screws and 6 washers for spacer. 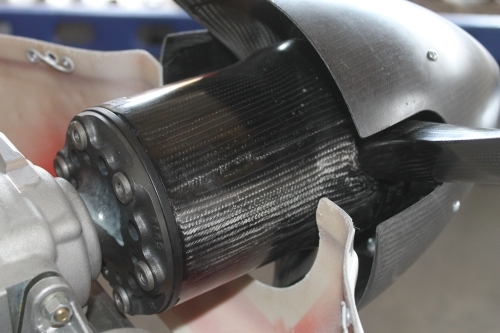 The "Extended Hub" solution allows to reduce of 61% the number of parts necessary for the propeller's assembly. For the moment, this light, strong, secure and cheap solution is available for the 3-blade tractor propellers for Rotax serie 9 engines (DURANDAL range). Sometimes it is necessary to have a spacer between the propeller and the reducer flange, whan the engine is far inside the engine cover. => you don't need any spacer. Please indicate He = 0 in your order. => you don't need any spacer. A 5 mm spacer is usually enough to space the propeller from the engine cover. A picture of your present propeller assembly, taken above the engine and from the side, could help the E-PROPS team to see if a 5 mm spacer is necessary. => you need a spacer. An extended hub as proposed by E-PROPS is a very good solution : light, strong and cheap. To know which extended hub, please see § 4. If your aircraft need an extended hub and if you want a spinner, you must have a spinner assembled by front of the propeller. If your spinner is assembled between the propeller and the gear box side plate, il would not be possible to use it, because the extended hub is a one-piece carbon part, and it is prohibited to cut it (see § 5). - you order a complete set : E-Props propeller + extended hub + standard spinner. - you take a mini-spinner (diameter 130 mm), which is available for each E-Props propellers, tractor or pusher. Simple, very light and cheap solution. - you order an E-Props with a standard hub, and you keep the aluminium spacer you already had before, and your spinner. You just have to check : first, if your spacer has a drilling patern 6M8d101,6 ("big" Rotax drilling patern), and then if your spinner is a 3-blade model. You probably woud had to adjust your own spinner, so E-PROPS does not recommended this solution. 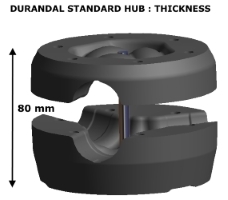 The thickness of the standard DURANDAL hub is 80 mm. Then it is necessary to add the good thickness to replace a spacer. To order an extended hub, you just need to take a measure. It is very simple. - then add between 5 mm and 10 mm to this measure M to define the thickness of the extended hub which necessary to your aircraft. 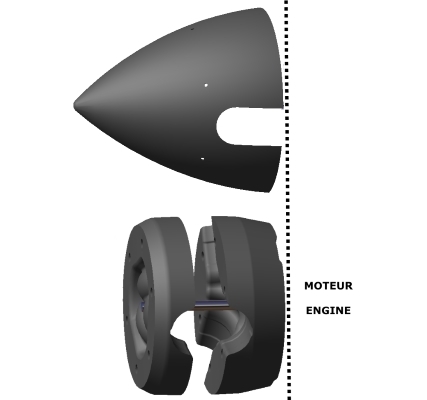 5 mm or 10 mm : it depends if you prefer to have the propeller close or far from the engine fairings. Be careful to keep enough place to dissamble the covers. See below. The E-Props spinners are assembled on the flange of the propeller, so they are adapted to all hubs configurations. Note that the back of the spinner arrives just in the back plane of the hub, near the blades feet. The plate of the spinner is adjusted on the middle of the spinner. The standard gap between the spinner and the engine cover is usually between 5 and 10 mm. 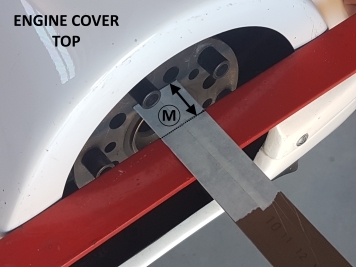 If you need a larger gap between the spinner and your cover, then add more mm to your M measure. NEVER cut an E-PROPS extended hub. The extended hubs are designed and manufactured for a defined length. Cut them is similar to destroy the mechanical strength of the hub. This would be very dangereous. There is no risk to do this by accident : it would be very noticeable that a hub has been cutted. If the hub is cutted, it is destroyed. If you have no the good length, please contact us to find a solution.